As the name suggests, a self-closing gate is a gate that closes automatically after the user passes through. In most cases, the self-closing action is achieved via a spring or springs, which extend as the gate is opened and retract to pull the gate closed. More advanced models may utilize electronic motors to close the gate after use. A typical self-closing gate. Photo courtesy of Dakota Safety. Because of attendant safety requirements, most industrial self-closing gates are designed to meet OSHA standards for top- and mid-rail height. 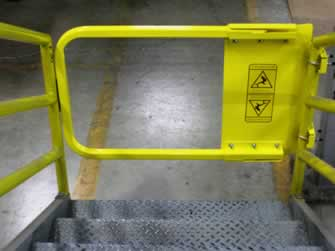 They are generally constructed of heavy-duty materials, and are often painted “safety yellow” or other high-visibility colors. Most manufacturers offer a variety of standard gate sizes that will fit most installations; some also offer custom self-closing gates to fit specific openings that do not conform to “standard” sizes. Many self-closing gates are designed to swing in both directions for ease of use. This allows users to open a gate simply by pushing it from whichever side he or she is on, a boon when the user has his or her hands full. Dakota Safety, a leading provider of fall protection systems and safety products, offers self-closing gates for industrial applications. Their OSHA-compliant gates use stainless steel torsion springs for their closing action and are built with uniquely strong single-pull, double-latching mechanisms for added safety.